Student Disability Services at OSU-Tulsa provides support services to students with disabilities and is committed to providing equal access to programs, services and activities. View the OSU-Tulsa Student Disability Handbook below or download it in PDF format. After completion of admission, students should contact Student Disability Services to initiate their request for services. Provision of services includes an intake process during which documentation of the disability is gathered and appropriate strategies and resources are identified. Students must provide documentation of their disability prior to receiving services. Students should submit documentation from a qualified professional stating the nature and severity of the disability, the diagnostic procedures used, and recommendations for assistance. Students with Learning Disabilities or Attention Deficit/Hyperactivity Disorder must submit documentation of an adult psycho educational evaluation performed by an appropriately qualified professional. Information obtained is confidential and is used solely for the purpose of identifying appropriate support services. OSU-Tulsa will reasonably accommodate students with a disability unless such accommodation poses an undue hardship, results in a fundamental alteration in the nature of the service, program or activity or causes undue financial or administrative burdens. Oklahoma State University is committed to compliance with the Americans with Disabilities Act (ADA). For information regarding the University's ADA compliance plan, contact the University's Student Disability Services at 918-594-8354. Instructor Notification - To aid students in securing the appropriate services, SDS provides instructors with written verification of a student's disability status and recommendations for academic accommodations. Testing Accommodations - Student Disability Services can provide students with an exam proctor, private testing room equipped with a computer and alternative testing formats. Tests are to be scheduled in advance with Student Disability Services to insure proctor and room availability. Classroom Accommodations - Students may request reserved seating arrangements for their classes to accommodate their disability. Student Disability Services can also provide a padded chair. Other classroom accommodations may include use of a lap top for note taking, copies of overhead media and extended time on exams. Mobility Training - Mobility training is available to familiarize students with the OSU-Tulsa campus. Interpreter Services - Nationally Certified ASL interpreters are provided by the Student Disability Services Office for students who are hearing impaired. Students are encouraged to enroll early to insure availability of interpreters. 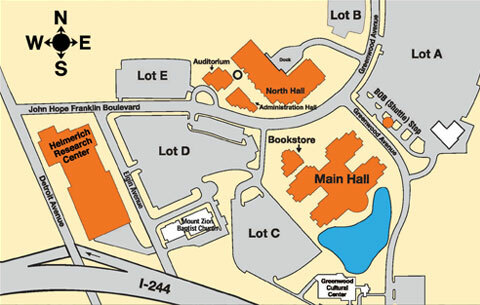 Assistive Technology - There are two video relay phones on campus (North Hall 204, Library) for the hearing impaired. Students may request digital textbooks as well as audio recordings of text books through Student Disability Services. The following assistive technology programs are available to students, Read, Write and Gold, Magic, Jaws and WYNN. SDS also provides digital voice recorders for recording lectures. Additional Services - Additional services are provided on an individual basis and may be dependent on physician recommendation and individual needs. Students are responsible for requesting services each semester or at the time a need is identified. Services are free of charge to students.